Ripple Grove Press, 9780991386659, 36pp. “This just will not do!” says Lizzy, flinging a rock from her shoe. A simple matter—getting a rock in your shoe—but what is small to one may be large and looming to another. After encountering a number of characters and situations, the rock continues its tumbling excursion of what goes around comes around . . . The illustrations by Kathryn Carr are hand-cut paper silhouettes. Designs are cut from white paper and arranged in a diorama. The stage is illuminated from behind and below and the scene is photographed. The result captures the warmth and depth of the art and invites the viewer to explore this creative story. Troy Howell is an author and illustrator known primarily for his children’s book illustrations—in particular the Brian Jacques Redwall covers and several books by Mary Pope Osbourne. His middle grade novel, The Dragon of Cripple Creek, was an ABA New Voices pick and shortlisted for the Reading the West award. He is working on his next children’s novel. He lives in Falmouth, Virginia. Kathryn Carr creates cut paper silhouettes which are little vignettes that embrace a moment in time. She is self-taught in this medium and enjoys experimenting with different applications for her imagery. Her art is in galleries and private collections worldwide, on a line of greeting cards, and album covers. She lives in Bethel Park, Pennsylvania. 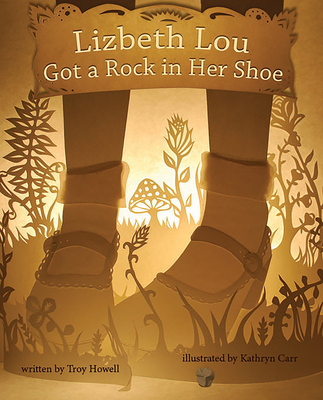 Howell (The Dragon of Cripple Creek) and newcomer Carr trace the elaborate journey of a rock after it gets stuck in a girl’s shoe: “ ‘Ow!’ Lizzy said. ‘This just will not do!’/ She flung it, it crashed... in a cricket’s canoe.” Playful details pop up throughout Howell’s rhymes (a trout spits the rock onto a duck’s umbrella, and a bird with a spyglass later spots it balanced on a woman’s hat pin), but it’s Carr’s elegant cut-paper dioramas that command attention. Rendered in warm browns and lit by fiery golden light, their whimsy dovetails nicely with Howell’s verse, while out-of-focus trees and grasses create a lovely sense of three-dimensionality. Carr’s trees feel inspired by the art nouveau movement and, along with characters’ formal attire, seem to plant the story in the early 20th century (a wide-angle view of the park reveals an angel fountain and nearby buildings, suggesting New York City’s Central Park as a possible setting). An ending that brings the rock full circle may leave readers considering the unknowable effects of small, spontaneous actions. Ages 2–7. Author’s agent: Sara Crowe, Harvey Klinger.